Plungers dry off after taking a cold dip. From left, CSEA Suffolk Retirees Local 4th Vice President Meg Shutka, Town of Brookhaven White-Collar 4th Vice President Eric Shutka, Town of Brookhaven White-Collar Unit Executive Vice President Walter Dunn III and Brookhaven Commissioner of Information Technologies Scott Bradley. MT. 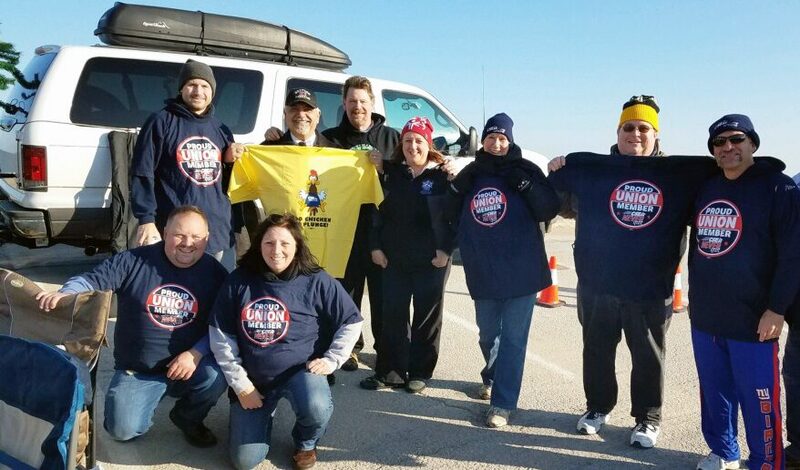 SINAI — CSEA’s Town of Brookhaven members were ‘freezin’ for a reason’ at the Town of Brookhaven’s 9th Annual Polar Plunge. 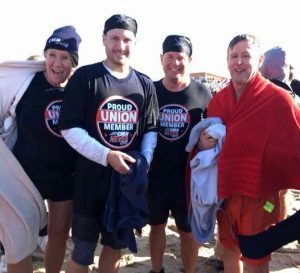 Members braved the cold waters at Cedar Beach in order to raise money for the Special Olympics; this year, members raised $1,500. Special Olympics is an international organization, which promotes inclusion, acceptance and understanding to people with intellectual disabilities. If you would like to donate or participate in a polar plunge visit: specialolympics-ny.org. Top, plungers pose with Long Island Region president Nick LaMorte moments before they jumped into the cold waters of Cedar Beach. Standing, from left, Brookhaven White-Collar Unit 4th Vice President Eric Shutka, LaMorte, Brookhaven White-Collar Unit activist Bob Brandow, Special Olympics representative Diane Cantone, CSEA Suffolk Retirees Local 4th Vice President Meg Shutka, Brookhaven White-Collar Unit President John Kelly and Brookhaven White-Collar Unit activist Mike Kobasiuk. Kneeling, from left, Brookhaven White-Collar Unit member Alan Pollack and Brookhaven White-Collar Unit activist Laura Boland. Photos provided by Bob Brandow.